Hans Meyer is the founder of the Meyer Law Office, P.C. His practice specializes in immigration law and removal defense, criminal defense and postconviction relief, the immigration consequences of crimes, and the civil rights of immigrants. Hans advocates for the statutory and constitutional rights of immigrants before various immigration agencies and state and federal courts, often against governmental and institutional abuses of power. 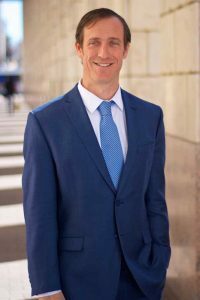 He is a former trial attorney with the Colorado State Public Defender, where he became an expert in the field of crimmigration law and developed a statewide immigration advisement system for indigent noncitizen defendants. Hans also served as the former Director of Public Policy for the Colorado Immigrant Rights Coalition, where he focused on local, state, and national immigration policy. As a nationally recognized expert, Hans frequently lectures, publishes, and appears in the press on issues related to immigration law and the criminal justice system. He also serves as an expert on immigration consequences for the Alternate Defense Counsel throughout Colorado. Hans has been honored for his public interest litigation and advocacy by the Colorado Criminal Defense Bar (CCDB), the American Immigration Lawyers Association (AILA), and the Colorado Hispanic Bar, among other organizations. He is an active member of AILA, CCDB, National Immigration Project, National Lawyers Guild, the ACLU of Colorado, and the Colorado Hispanic Bar Association, and serves on the board of directors for several nonprofit organizations, including the CCDB and the Colorado Criminal Justice Reform Coalition. Hans grew up in Aurora, Colorado, and is a 2006 graduate of the evening program at the University of Denver Sturm College of Law. Prior to his career as an attorney, Hans was a forest firefighter, construction worker, and Outward Bound instructor. He also spent several years living, working and traveling in Latin America, focusing primarily on human rights issues in Guatemala and Chiapas, Mexico. Hans is admitted to practice by the Colorado Supreme Court, the United States District Court for the District of Colorado, and the Tenth Circuit Court of Appeals. He regularly appears on behalf of immigrants before agencies including United States Citizenship and Immigration Service, as well as in immigration cases before the Denver Immigration Court, Board of Immigration Appeals, the United States District Court for the District of Colorado, and the Tenth Circuit Court of Appeals. Hans also represents noncitizen defendants in criminal cases and petitioners in postconviction matters in state district courts, the Colorado Court of Appeals, and the Colorado Supreme Court.